"For sale: c1909 California autocycle. Motor needs work." It sounded interesting. When I saw it an hour later I was amazed. Not 1909, surely? It was the first time I had seen a motorcycle with wooden rims - although common on early American bicycles, they were rarely used in Australia. When I got it home, I was still puzzled. But after considerable head scratching, and the discovery of 1902 patent dates on the engine and coaster rear hub, I was convinced it was very early indeed. Confirmation came from a line drawing in Victor Page's classic book "Early Motorcycles: Construction, Operation, Service". The book itself dates from around 1914, but the drawing of the Yale (California) which closely resembled my new find, was in a section labelled "Some Early American Motorcycles Which Show a Wide Diversity of Opinion Regarding Essentials of Design Which are Standardized at the Present Time". The machine turned out to be a fascinating one. Although the motor had had a major disaster at some stage (thus the flywheel on the wrong side and a non-standard crank), in this it kept illustrious company. When George Wyman became the first motorist to cross the continental US under his own power in 1903, his only major mechanical failure was a broken crank! The California Motor Company of San Francisco was short-lived. Announced in October 1901 to build a machine designed by Roy Marks, two years later in October 1903 an announcement appeared to the effect that the Kirk Manufacturing Company and the Snell Cycle Fittings Company were to merge to for The Consolidated Manufacturing Company, and that this company, based in Toledo, Ohio, had acquired the rights to the California motorcycle. 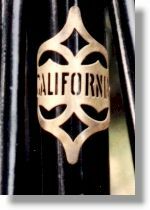 The new machine, to be manufactured on the old machinery which had been shipped to Toledo, was to be called the Yale -California. 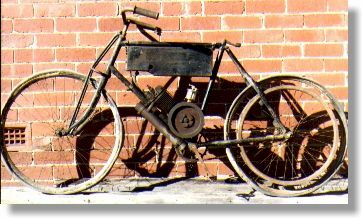 The first Yale motorcycle.